What should I set my spark plug gap at? Unlike previous years we haven't yet found a need to re-gap the stock 2015-2016 Ecoboost spark plugs. How much time will the MPT tunes take to build? MPT Tunes are completed in order they are received. Typical turnaround time is approx. 3 business days, but times may vary. If you are in a hurry, upgrade your tunes to 'RUSH MY TUNES' status. This will put you at the top of the line. PR-X, also known as Performance Race Xtreme, is our top-performance tune for the Ecoboost F150 with a massive dyno proven gain. This is by far the preferred tune on this truck due to the ridiculous power gains over stock. The truck feels so much lighter with the increased throttle response and part throttle boost. With this tune you are looking at huge increases in low end torque and acceleration, faster 0-60 times, quicker 1/4 mile results, shift points optimized with a focus on performance. The shift points will happen at a higher rpm/mph than stock and will be firmer than stock. If Sport mode equip, it will have a noticeable increase in throttle response above that of the already increased base shift mode. The PR-X tune is only available for premium fuels of 91 octane or better. The E30 version is designed to be used with a mixture of E85 and premium fuel. Combined mixture can be up to E30, the E30 tune can also be used with unleaded high octane race fuel. This tune has all the benefits of the above PR-X but has the trans setup very mild for those that prefer the stock feeling shifts of the truck. The Performance/Towing tune is a step down from PR-X. 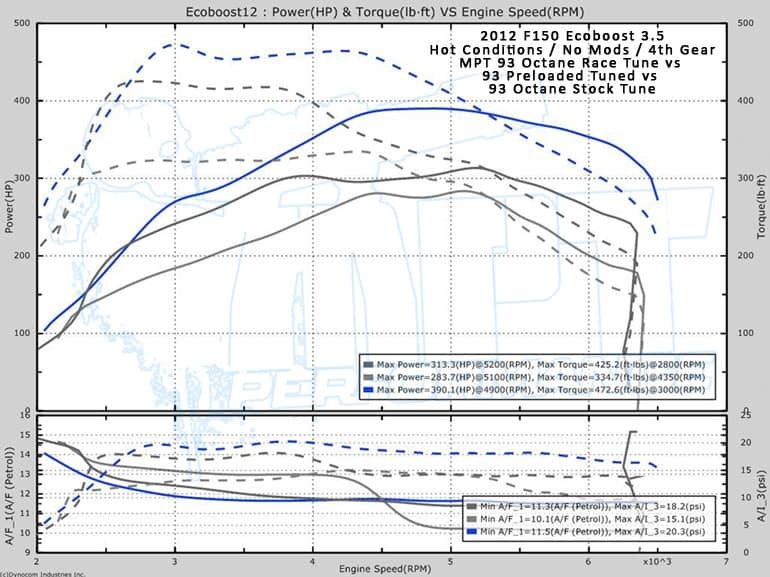 Designed to be a performance tune and a towing tune hybrid the main difference is the peak boost. Peak boost is lower than PR-X but we were able to keep most of the improvements from PR-X. Throttle response and part throttle boost is still a drastic improvement over stock. This tune can be referred to as the "Street" or "Daily Driver" tune with a focus on all around performance but not so much that it is no longer a good idea to tow with it. This tune has all the benefits of the above Performance Tow tune above but has the trans setup very mild for those that prefer the stock feeling shifts of the truck. This tune can be used with any octane fuel, the concept behind this tune is to take the improved shifting and performance of the PR-X tune but leave spark, boost and other items stock allowing them to adapt the fuel in the vehicle. Throttle response and part throttle acceleration will still have a noticeable increase over stock. The Perf-Econ tune, also known as Performance Economy Hybrid is a blend of low end fuel economy and top end power. This tune keeps the closed pedal and very low throttle positions controlled to make sure fuel economy is optimized. Then it also has improvements on power and throttle response at higher pedal positions. Shifting is setup to be basically stock which means higher gears at low rpms and vehicle speeds. Great tune for those that want the option for power but don't want it full time. Octane: Gas vehicle tunes are heavily impacted by the octane of fuel being used. If you want power, run higher octane. Running a higher octane allows us to advance the spark more which results in better performance. That being said, you should pick tunes for the octane you plan on running. If you always have and always will run 87-89 octane, then that is what you should choose. You can run a tune for 87-89 octane and fill the tank with 93, however you cannot run a tune for 93 octane and fill up with 87-89. Doing so will result in knock activity, a loss of power output and in rare cases, possible engine damage. Our recommendation for performance tunes is to run the highest octane available. This is especially important on a turbo vehicle. The E30 version of tunes are designed to be used with a mixture of E85 and premium fuel. Combined mixture can be up to E30, E30 tunes can also be used with unleaded high octane race fuel. MISC TUNE SETTINGS - Info for the comments section. Thermostat: If you have an aftermarket thermostat, list the degree such as 170* and your fans will be updated. Aftermarket Cold Air Intake: If aftermarket, list brand and model of the CAI. Aftermarket Cat Back Exhaust: If aftermarket, enter brand and model of the Exhaust. Methanol Injection: If the truck has an aftermarket meth injection kit, indicate it on the form and include details of the kit in the comments. 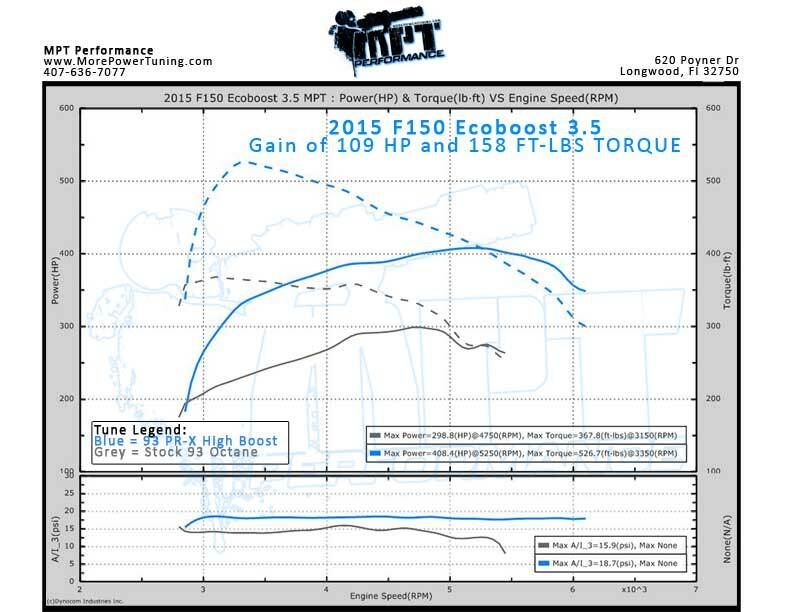 2015 F150 Ecoboost 3.5 Dyno Graph: 4th Gear Dyno Pull, MPT 93PR-X, Stock on 93 octane.